Kickboard's PBIS software app and training services help you implement programs that improve student classroom behavior. What is PBIS in Schools? PBIS, or Positive Behavioral Intervention Supports, is a research-based, proactive strategy that creates the behavioral systems and structures needed for all students to grow academically and socially. Its goal is to provide a safe and supportive school climate by creating consistency across a school and meeting the unique needs of students at varying levels of behavioral and social/emotional development. At the core of PBIS is the belief that all students can exhibit appropriate behavior. With Kickboard's PBIS software management system, teachers benefit by tracking student progress better, and students benefit by better understanding what's expected of them across different learning environments. Kickboard helps schools implement proven schoolwide systems and practices that help teachers effectively manage classroom behavior and improve school culture and climate. Watch this 7th grade teacher use PBIS to manage content instruction & student behavior with the classroom skills necessary to be successful. Kickboard’s PBIS app and training services help you integrate your program with its easy-to-use app, online reporting and data analysis system and professional development. Kickboard provides the means for schools to accurately track behavior data, assess culture needs, evaluate program effectiveness, and reward students. We are unique in helping you facilitate all aspects of a fully integrated PBIS model and support schools in creating a positive school climate. As you implement PBIS, it's important to identify and track the right behavior metrics that will ultimately address the goals of your school. In our experience serving thousands of teachers, we have identified the underlying behavior metrics that help address a variety issues and initiatives through our software management system. Achieving a thriving school culture requires more than just handing teachers an app and expecting positive results. Leaders must cultivate the right mindsets, systems, practices, and data to create sustainable change. Whether schools are just beginning this journey or are further down the road, Kickboard professional services and PBIS training programs meet schools where they are. Our team guides and coaches leaders and teachers in a continuous cycle of improvement toward the positive behavior intervention supports and school culture outcomes that students deserve. Help students achieve positive social and emotional character development. 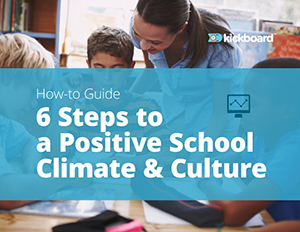 With just a tap, track and reinforce the behaviors that make up your ideal school culture - from traits like 'supportive' and 'helpful' to behaviors like 'participation' and 'teamwork'. Effortlessly motivate students while saving a lot of time, paper, and patience. Kickboard automatically keeps track of behavior points, scholar dollars, student paychecks, and school store rewards. Whether for celebration (a popcorn party!) or concern (detention), Kickboard automatically adds students to rosters based on what’s actually happening during the day. You'll know instantly who belongs where. Everyone should share in positive achievement - on a whiteboard, in the lobby, or even an iPhone. Reinforce your positive behavior champions with real-time culture leaderboards that can be displayed anywhere. Get a Personal PBIS Demo!